The Fisher gear is superbly made and I think even undervalued today. Get them while you can at current prices. This is what I plan to do over the next year. 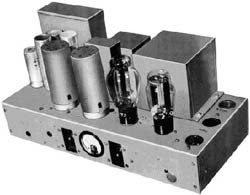 The Fisher tube preamps, tuners, amplifiers and receivers are just wonderful. 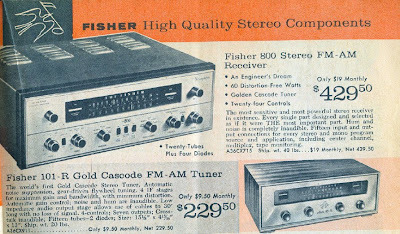 My first exposure to Fisher was a Coronet 100-T preamp/tuner and SA-16 amplifier. It was a great combo. If you see a console for sale you would do well to look inside. There is gold in those consoles. 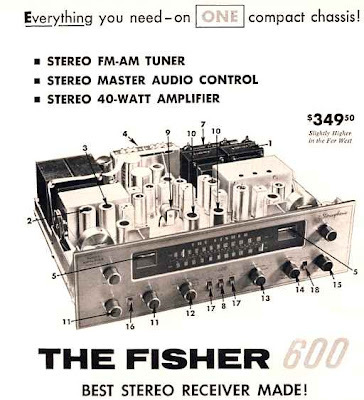 You can't go wrong with a Fisher 500 600 or 800. Of course this is just to name a few as Fisher had a long line of wonderful products. Here are a couple of advertisements for Fisher's. 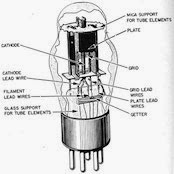 I've been doing research off and on regarding Western Electric 300B amplifiers. 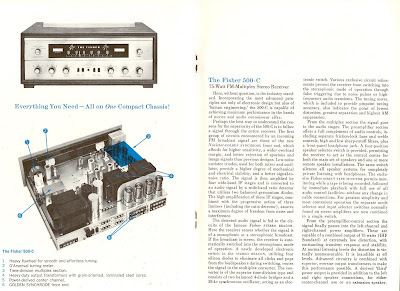 A real favorite is the 91A 300B amplifier. 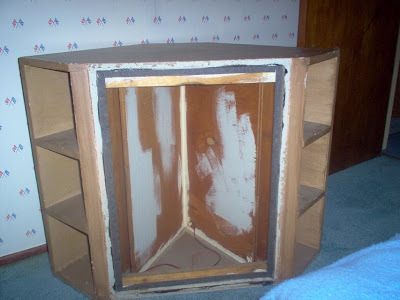 I found Min's Tube Audio Lab searching for modern WE91A builds. It seems Min can build them for many price ranges and as customized as you can afford but they start at $1750 per pair. They feature point to point wiring just like they used to build them. You won't find pcb's in these amps. Check out his portfolio as it is impressive http://www.tubeaudiolab.com/id22.html Here are a couple examples of his work. He does more than WE91A builds so if you need custom work check out his site and see if he is the guy to build your next amp. I wonder how much he would charge to build a Brook clone for me. I had the opportunity to hear a pair of these JBL L200 studio monitors recently. They are pretty big and two way. The demo was nice but I'd like to live with a pair for a while to form a proper opinion. Gotta love these big JBL studio speakers. I've only heard the Model 19 once but it was a great experience. This is a great two way design. The 811 HF horn is great perhaps one of my favorite vintage horns. 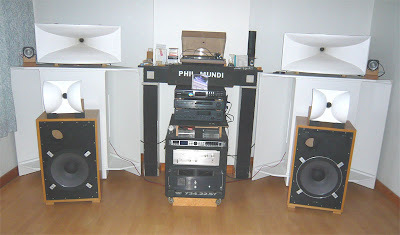 Here is some more great Brittish Hi-Fi. 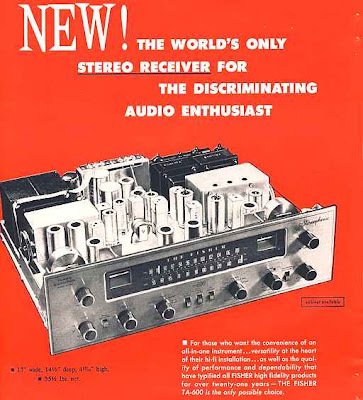 This ad has the Point One preamp and Stereo 20 and TL-12 amplifiers. The Leak Stereo 20 is on my list of amps I want to own. This is a little early but I may be out of town tomorrow. One of my favortites Mamie Van Doren. If you like retro movies try Three Nuts In Search Of A Bolt it is a fun movie no matter what the reviews say. 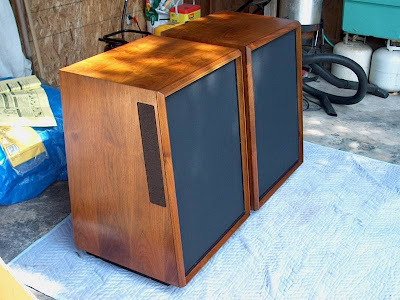 This is a great pic someone posted on the Klipsch forum. Obviously from the 50's with a nice mono system featuring his prized Brook amp and preamp. 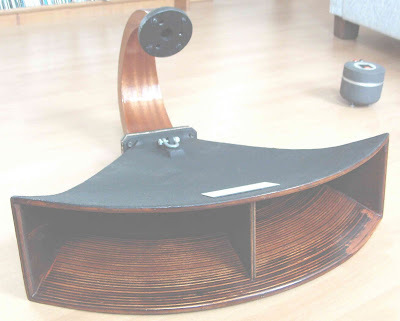 Does anyone know what model turntable and tonearm that is? ( edit tonearm looks like a Grace 108c ) The clearly homemade system stands are interesting. Perhaps more timely in the 50's. 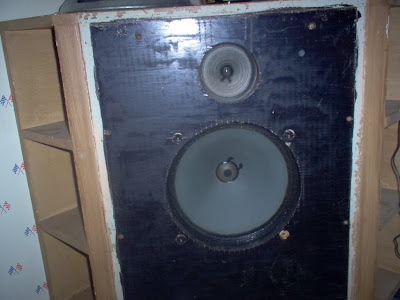 1 makes sense 2 might be dated unless you are listening to older recordings 3 can help with room issues 4 is more like my 2 and 5 is my number 1 which basically says have as big of a speaker as possible. 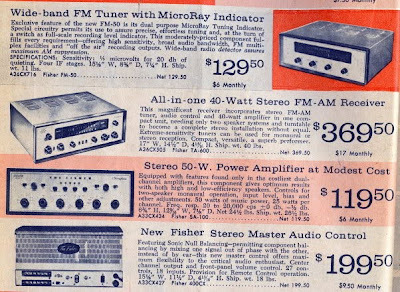 I'd like to see some of the pioneering audio companies that are still standing to actively tell people what they need to know about hi-fi. Altec of course is out of the game but JBL could step up. 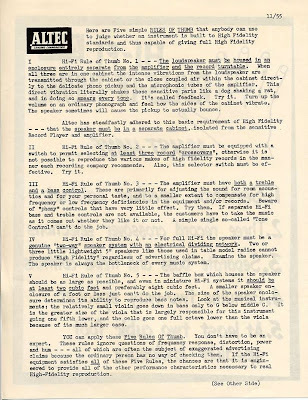 The Dope From Hope should be resurrected by Klipsch to teach those selling their speakers so BS could be kept at a minimum. I've learned alot about Garrard since I found my Garrard 301 last year. 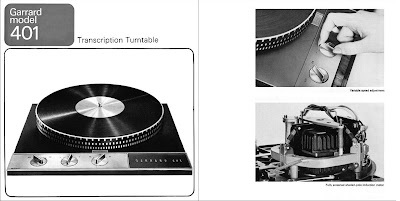 Before that I only knew about their console turntables not their high end tables used by the BBC and most professional studios in the 50's and 60's. The Garrard 401 was an updated design although mostly cosmetic. The 301 is more curvey and retro while the 401 is more straight lined and modern looking. Both 301 and 401 are beautiful designs. I'd like to find one some day. 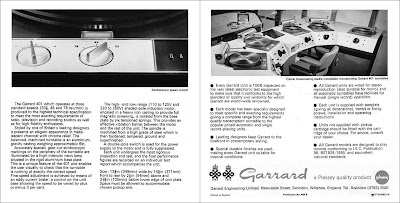 Here is an ad for the Garrard 401. If I were visiting Belgium horns would not usually be at the top of the list well at least not until now. After I had my fill of fine Belgium Ales and food horns would be a great idea. The Horn Academy builds very high quality horns. It appears the site is run by Philip Mundi who builds the horns designed by Mr.Iwata as well as some fine reproductions. It is refreshing to see some curves published for these horns. 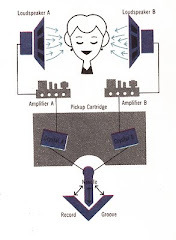 If you have JBL, Altec, TAD, or other high quality drivers these guys can help you out. Check out these horns. 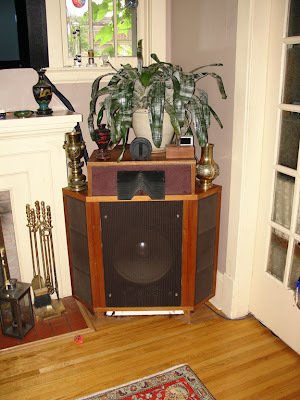 The wood version of an Altec 1505 is stunning. The pics on the site aren't that great but at least the horns are. There Klipschorn LF build is stunning. The built in corners definitely help performance. Explore there site. http://horn.hebfree.org/ You may require google translation. 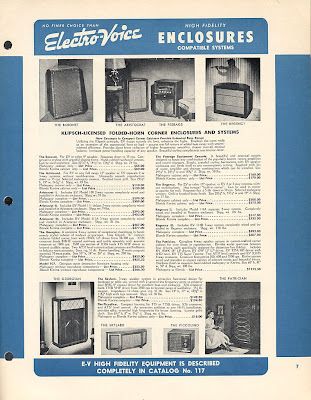 There was a very close and financially beneficial relationship between Electro-Voice and Klipsch for many years but especially in the early days. 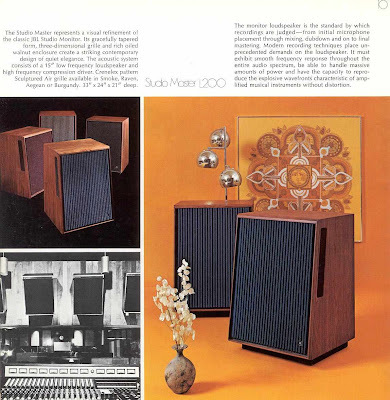 Almost all of the Electro Voice folded horn designs were licensed from Paul Klipsch. That was what PWK did best in my opinion. 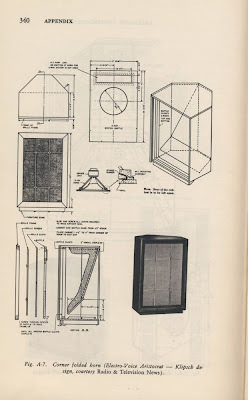 One of the best speaker cabinet designers. This was also no secret it is mentioned openly and proudly in early hi-fi literature. Electro voice also took PWK concepts and ran with them. 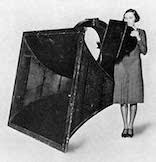 Look at the Patrician IV which was a gigantic Klipschorn an 18 inch woofer. There are traces of PWK all over the Electo Voice literature. This sort of business relationship is very interesting to me. Next time I get to talk to Mr.Hunter at Klipsch I'll have to ask about this. It would be nice if Klipsch would write a Paul W Klipsch biography from more of a technical standpoint like the McIntosh and Quad books. 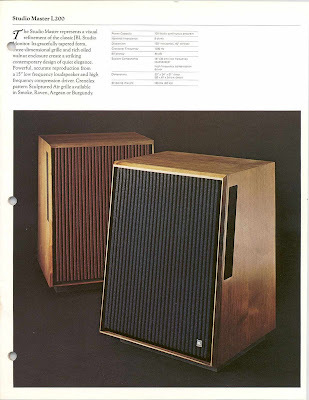 A history of every speaker and prototype would be very nice. The Linos portable record player is a concept record player. Not sure if it will see production but it is cool. 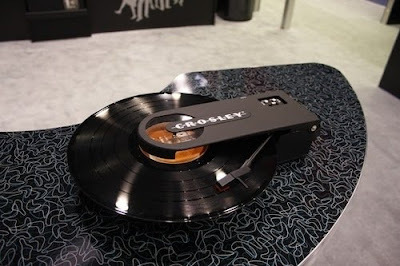 The Crosley Revolution turntable will be in production soon and costs about $150. I'd like one of these to take record shopping. It would really help demo record quality. That is if the shop owner deosn't mind. I don't see a 78 option unfortunately. The Linos looks really cool but the croswley seems more rugged. I've always curious about what some of my favorite artist use for hi-fi playback. 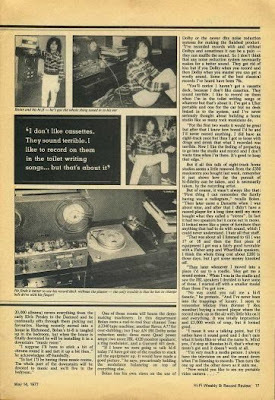 This Marc Bolan interview posted at TillDawn just made me smile. Marc Bolan records always sound so good to me and it is great to learn how much he cared about the finished product. Here are some insights to Bolan Universe. Marc Bolan's hi-fi rates a little below zero in the good looks department. Oddly the enfant terrible who once foisted glam rock on the world and rouge on the teenage male face, couldn't care about audio cosmetics. The now-acclaimed Godfather Of Punk prefers sounds to looks when dealing with the hardware of his profession. In the playback stakes he has a rugged Thoresn TD 150 Mk II turntable which, apart from the scratched wood veneer and assorted grease splashes, has a die-cast platter missing! "Oh I took that off," admits Bolan. "Records are so badly pressed these days that a 12in platter only helps to accentuate any warping. I find it better to use the deck without one, only trouble is that I ahve to change the belt drive with my finger." The SME arm is fitted with a Shure Supertrack V15 Type II cartridge, which was about to fall out. After negotiating these hurdles the disc signal goes through a Quad pre-amp fitted to a Quad 303 power amp finally emerging out of two JBL Model 4320 Studio Monitor speakers. The result is fascinating - especially as Boaln demands more treble than bass and keeps the 7Khz button on the pre-amp depressed. The volume control is turned up high. "This is practical hard-wearing stuff for me. It's been all over the place, Los Angeles, Monte Carlo, and it's still usable. The Thorens deck is really kicked about but it's still good. The set-up is a very true sound, a very real sound. I've got the whole thing tuned to my ear, or the pulse of the generation if you like," he acknowledges with a smile. "Most people listen to hi-fi wrongly," he says. "Practically everyone's house I've been to they have too much bass on because they think it's groovy to impress their girlfriends when it shakes a cheap bottle of vino. 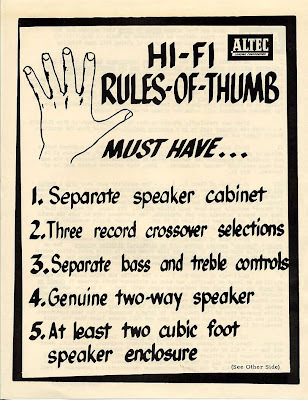 You know, it's stereo innit! I hate that. I love bass, but hat that boom. Bass has got to be bright funk." By the way of another demonstration Bolan plays the latest 10cc single at shattering volume. It also has crystal clarity. After more thatn a decade in the rock business, a string of No 1 hits and a current single (The Soul Of My Suit) and album (Dandy In The Underworld) in the charts, Marc Bolan has proved that he knows about musical sound. And although his system, with its snake lair of wires all over the place, may seem a little unorthadox to anyone with the latest Bang & Olufsen design, it is highly effective. 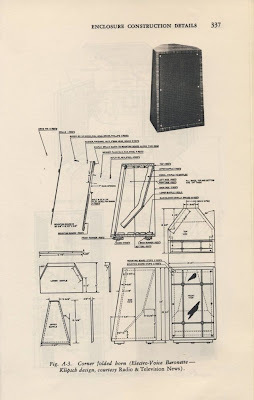 The secret lies inthe JBL speakers - expensive studio models - which Bolan says replaced a pair of Wharfedales he had many years ago. "But as I progressed i wanted the system louder and louder. The point is if you go mixing a tape in the studio and you bring it home, I like to hear it on the same level. All rock musicians are deaf," he laughs. "Or let's say insensitive to mellow sounds, so I have to have plenty of power in my hi-fi. In fact we used the Quad amplifiers on stage at one time. I've got some more in the other room and a couple more of the same speakers, I think I nicked all the gear out of the studio one day," he smiles again. "But seriously I don't try to chase after the latest audio stuff because although this is very much a utility system, it's good stuff. 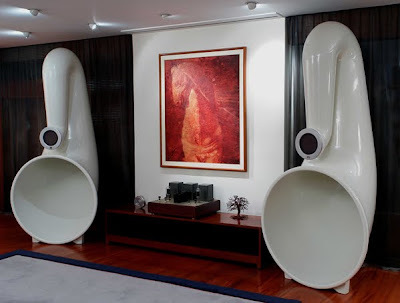 Idon't think you can get a better sound at home. There's low distortion; a wide tone spectrum and also plenty of volume. Mor than that you can't ask. I actually master records myself - you know, cut the laquer - and that's the truest sound. When I bring it home and play it on this set up it does sound the same as when i cut it in the lab." One thing missing from Bolan's "playback" system is a tuner. Instead he listens to a fairly ordinary transistor radio saying he prefers to hear pop music programmes that way. "That's how the majority of people buying records will first hear a disc, and it's good to identify with the type of listener you are making records for. "I did this once through a mixer," he says casually waving at the set-up. "It had limiting and echo on it as well so I could really play with the records, but I found that very unfair to the artist to have me re-mix everything. At the time I was listening to a Marc Bolan universe." The Bolan record collection, (roughly 20,000 albums) covers everything from the early Elvis Presley to the Damned and he continually sifts through them picking out favourites. Having recently moved into a house in Richmond, Bolan's hi-fi is tangled up in the bedroom, but when the house is finally decorated he will be installing it in a downstairs "music room". "I suppose I'll have to stick a bit of chrome round it and tart it up a bit then," he acknowledges off-handedly. In fact I'll be having three music rooms. The whole part of the downstairs will be devoted to music and we'll live in the bedroom." One of those rooms will house the demo making machinery. In this department Bolan owns a reel-to-reel four channel Teac A3340 tape machine; another Revox A77 for overdubbing; two Teac AN 180 Dolby noise reduction units; three more Quad power amps; two more JBL 4320 monitor speakers; a ring modulator and a Garrard 401 deck. "If I knew we were going to talk hi-fi today I'd have got one of the roadies to stack all the equipment up. It would have made a good picture," he says, precariously holding the modulator balancing on top of everything else. Bolan has his own views on the use of Dolby or the newer dbx noise reduction systems for making the finished product. "I've recorded records with and without Dolbys and sometimes it can be a pain - they can muffle the sound. So I don't think that any noise reduction system neccessarily makes for a better sound. They get rid of hiss but if you Dolby when you record and then Dolby when you master you can get a woolly sound. Some of the best classical records I've heard have been 78's. "You'll notice I haven't got a cassette deck, because I don't like cassettes. They sound terrible. I like to record on them when I'm in the toilet writing songs or whetever but that's about it. I've go a Uher portable and one for the car buy no deck linked in to the system, and I've never seriously thought about building a home studio like so many rock musicians do. "For the first two weeks it would be great but after that I know how bored I'd be and I'd never record anything. I did have an eight-track once but then I got so loose with drugs and drink that what I recorded was terrible. Now I like the feeling of preparing to go into the studio and record andI don't waste time when I'm there. It's good to keep that edge." 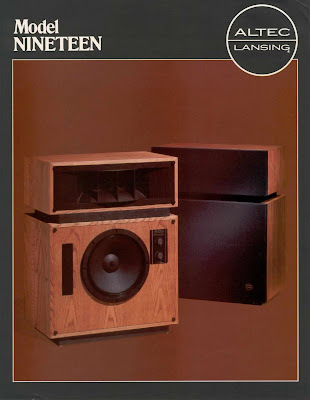 But if all this talk of eight-track home studios seems a little removed from the £ 350 musicentre you bought last week, remember it just shows how far the persuit of hi-fidelity can be taken, and is necessarily taken, by the recording artist. But of course, it wasn't always like that: "First thing I can remember the family having was a radiogram," recalls Bolan. "Then later came a Dansette when I was about nine and after that I din't have a record player for a long time until my mom bought what they called a "stereo". 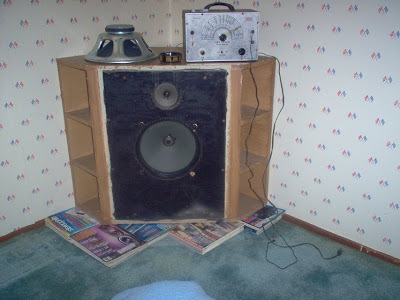 In fact it had two speakers but it came out in mono. It looked more like a piece of furniture than anything that had to do with sound, which I could never understand. I hate all that stuff. That was about all I listened to till I was 17 or 18 and then the first piece of equipment I got was a fairly good turntable with a Fisher amp and Wharfedale speakers. I think the whold thing cost about £ 200 in those days, but I got some money knocked off. "Then later whenever I moved into a place I'd say to the roadie 'Hey get me a sound system.' When I was in the studio and saw the JBL speakers I decided to have some of those. I started off with a smaller model that those I've got now. 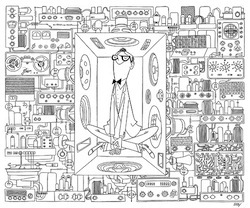 "No way could you call me a hi-fi fanatic," he protests. "And I've never been into the trappings of luxury. I seem to remember Mickey Finn (former T. Rex member) buying a record player where the record stuck up in the air with little bits on it and everything. It was totally impractical and £ 3,000 worth of crap, but it looked good. "I mean it was a talking point, but I'd rather have it sound good and I don't care what it looks like or what the name is. Mind you, I'd stop at a Russian hi-fi, that's what my mom's got and it doesn't work at all. "I'm very much a media person. I always have the television on and the sound down when I'm listening to records. Then turn the on up and the other down as it suits me. 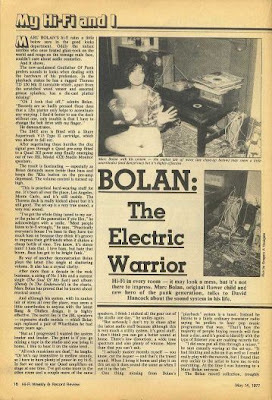 "Now would you like to see my portable video camera......."
Hi-Fi gear Bolan was using at the time this article was written. Brociner Electronics is a company I am having trouble doing research on. There is only a smattering of information here and there on the internet. I'm going to try to do more research on Victor Brociner for future posts. 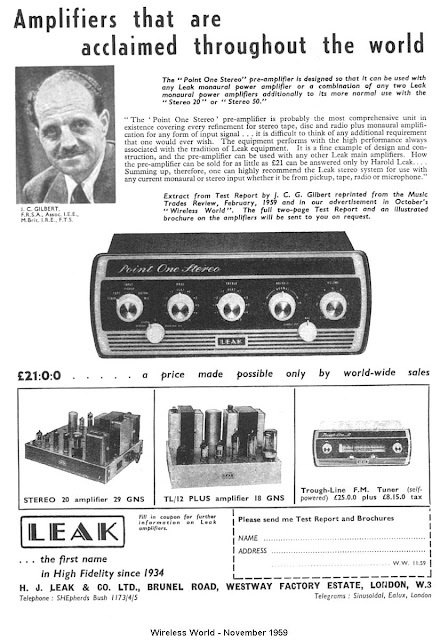 It seems he did some work for Fisher, Lafayette, Klipsch, Lowther and several other early Hi-Fi companies. 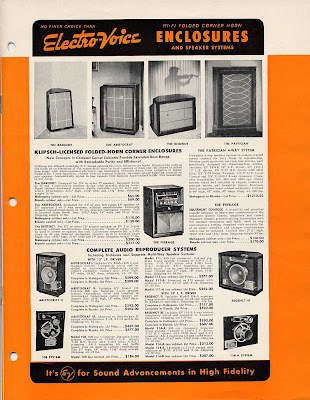 For Klipsch Brociner Electronics built some early Klipschorns cabinets but this did not last long. Brociner employed the best designs he could find. This leads me to this very interesting back loaded corner horn that has been discussed at the Lansing Audio Heritage forums. Thank you forum members spkrman57 and Beowulf57 for posting pictures and plans. 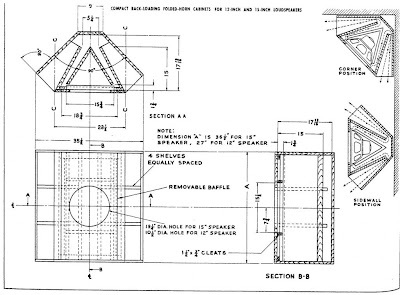 Here are the plans for the Brociner model unknown. Here are some pics of the Brociner back loaded corner horns. 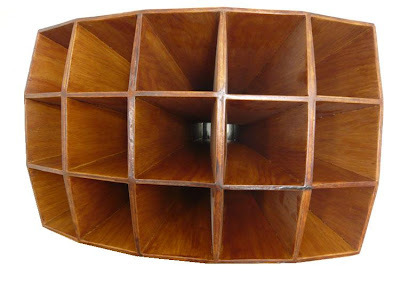 If anyone has documentation or information regarding Brociner Electronics speakers please let me know. 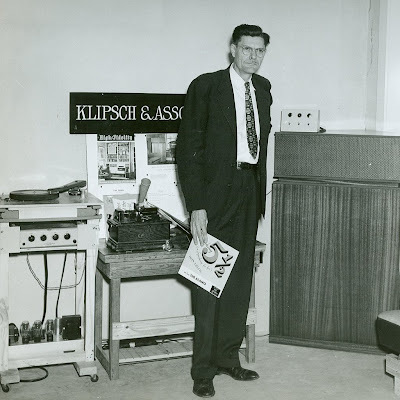 No other speaker can claim the title of longest continuous production speaker in the world like the Klipschorn. 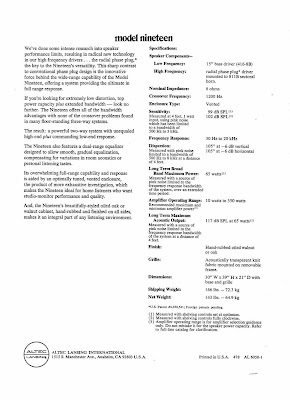 In 1945 PWK was granted patents for the Klipschorn X3 low frequency cabinet and the X5 or later k-5 high frequency horn. The first successful prototype was actually built in 1942. 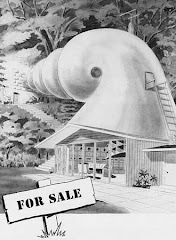 PWK had tried to get a patent on the first Klipschorn the X-1 but it was declined because there were other corner horn patents. 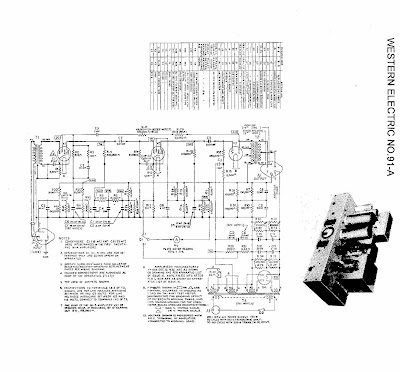 These are referenced in his 1945 patent application. The Klipschorn we currently know was flushed out in about five years. The changes since then have been largely cosmetic or changes in building materials. An amazing feat. 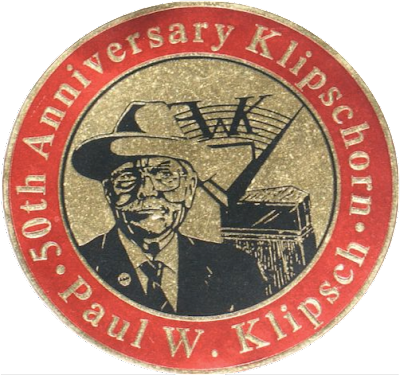 Here is a pic of the 50th anniversary Klipschorn I took several years ago at the PWK Museum of Audio History in Hope, Arkansas. 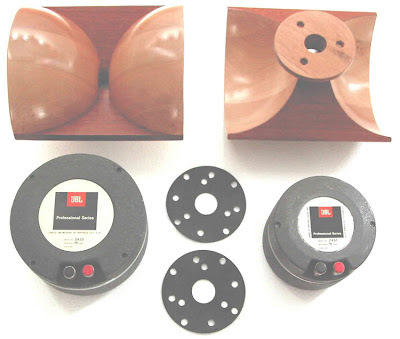 I don't post much about single driver speakers but these are very interesting. Check out these very beautiful single driver horns from Arcadian Audio. 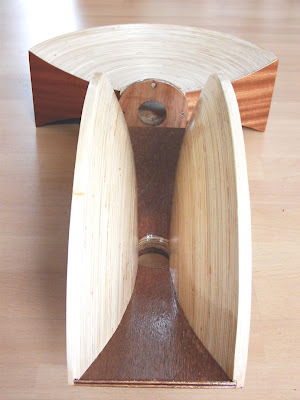 The Pnoe horn is the culmination of a 10 year effort to design and realise a horn speaker without compromises. A team of high-end enthusiasts with deep technical knowledge and access to advanced production equipment worked through many stages of design, mathematical and physical simulations, prototype development, and countless hours of listening and blind testing. In various times listening panels of jazz and classical musicians were employed to ensure that the direction is the right one. 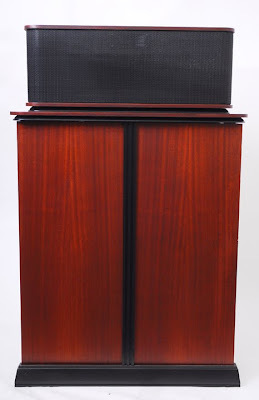 The Pnoe speakers are simply in a class of their own. They combine the best characteristics of single driver horn designs along with a clarity and fullness of sound which is simply unique. The sound is extremely dynamic, clear and correct. 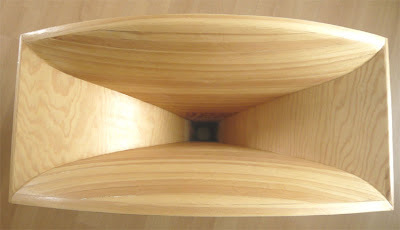 The bass extension, although not the deepest, is very fast and totally natural, unlike hybrid box/horn designs or multiple driver systems. The soundstage is wide and precise and the whole experience brings the emotions of a live performance.Voices are simply divine, horns are in the room, orchestras are alive! This excellent performance comes with a speaker sensitivity of 98db/W along with a favourable impedance curve, which means the Pnoe is perfectly suited to be paired with the smallest high quality tube amplifiers. A 300B makes the Pnoe sing effortlessly with authority and speed reminiscent of solid state monsters. 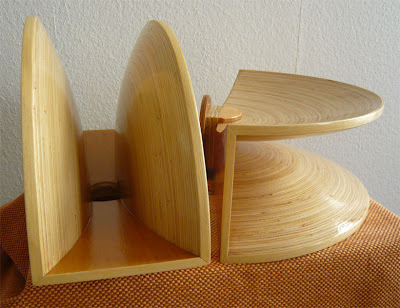 * Create the smoothest, roundest path for the sound wave front, without any obstructions, so that there are no sources of standing waves and spurious reflections. This was the spark which started the Pnoe concept. * Choose the ideal horn design. The design of the Pnoe is the optimized result of many tests, calculations and consecutive prototypes. 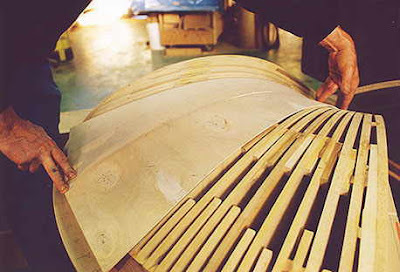 * Build the speaker precisely, using materials with a friendly sonic signature. The Pnoe is shiny in and out. It is made of fibreglass and special damping materials in the form of a sandwich, with special attention to resonance control where it is needed most. * Use the highest quality driver available. The AER MD3B was chosen for its ultra detailed presentation and its warm sound. It sounds like a point source electrostatic speaker with a sensitivity of 98 db/W! In the Pnoe it offers nuances like the ‘brassness’ of brass and the ‘woodness’ of violins and pianos, which have to be experienced to be believed! The reproduction of human voices is another area where the MD3B is simply in a class of its own.